The New River Gorge Bridge near Fayetteville is the second highest steel arch bridge in the United States and every October, on Bridge Day, people parachute and bungee jump 876 feet off the bridge. 75 percent of West Virginia is covered by forests. National Radio Astronomy Observatory site at Green Bank, West Virginia. In the Appalachian region of the eastern United States lies a state saturated with a proud history and natural beauty. Known for its blue collar working class, West Virginia is second to only Wyoming in coal production. Coal mining is a highly respected profession in West Virginia and its potential dangers add a historically romantic mystique to the east coast state. West Virginia is composed of an incredibly diverse terrain. The state's various forms of topography contribute to its reputation as a consummate travel destination for outdoor recreational opportunities. West Virginia is an underutilized travel hot-spot with limitless entertainment resources to offer its welcomed visitors. Like many other of America's fifty states, West Virginia was originally home to Native Americans. Ancient indigenous people in the region cultivated maize, tobacco and a number of other agricultural products. As they so often did in the Americas in the 17th century, European explorers settled in West Virginia and consequently devastated the native culture. The two contrasting cultures and lifestyles eventually came to violent blows and the militant English settlers informed the American Indians of the extent of their firepower. West Virginia is one of only two states formed during the American Civil War. West Virginia seceded from Virginia and joined the victorious side of the bloodiest war in American history. 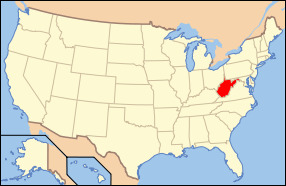 In 1863, West Virginia was admitted into the union as a state. There is an old adage that says a picture is worth a thousand words. One thousand words may not be enough verbiage when referring to the beauty of West Virginia. The state's geography is remarkably diverse and allows for an outdoors-man’s dream getaway. The mountainous terrain and refreshingly cool bodies of water make for an exceptional tourism experience. West Virginia is a unique destination for biking beautiful trails, fishing cool waters, hiking treacherous terrain, hunting wild animals, rafting unforgiving waters, or even enjoying eighteen holes on the golf course. West Virginia's charm is an amazing commodity built on a foundation of legendary coal mining, a rich Native American history, and the Appalachian Mountains. History buffs can ingest numerous battle sights and museums while visiting the Civil War hotbed. Traveling to West Virginia is a unique and mesmerizing adventure and is recommended to all travelers looking to temporarily escape the demanding city life. Whether you and your family are whitewater rafting or taking in the local cuisine, memories are sure to be made when exploring West Virginia's abundant wealth of assets. Helvetia, West Virginia is a small Swiss village in a high mountain valley. The original Swiss and German settlers arrived in 1869 and their descendants remain. Due to the isolation of the area, the traditions of dance, music, food, and holidays have survived through the generations. Hanging Rock Raptor Observatory - Since 1952, Hanging Rock has been a monitoring point for hawk, eagle, falcon, and osprey migration along the birds' eastern route.